Lighter winds and shorter passages make the Ionian ideal for a relaxed flotilla sailing holiday in Greece, popular with families and less experienced crews. Explore these beautiful Greek islands and experience gentle afternoon breezes, warm seas and friendly harbour-front tavernas. This flotilla is ideal for couples and families with children seeking a relaxed sailing holiday. The sheltered waters of the Ionian offer an unlimited number of tranquil bays and enchanting fishing harbours. Navigation is straightforward with no tides, currents or other hazards. There are good sailing breezes late morning through the afternoon, but winds rarely exceed Force 5. Anchor in picturesque bays or moor up in bustling fishing harbours. We don't believe in 'regimented' flotilla sailing. You're free to plot your own course and schedule for arriving at each day's destination. We won't make you come into harbour just when the afternoon breeze is at its best. The flotilla skipper is on hand to give you advice and support - from sorting out a snarled anchor to reserving you a table for dinner on the quayside. Less experienced skippers will appreciate his help with mooring "stern-to" or "bows-to" on the quayside at the end of an enjoyable afternoon's sail. And if you are an experienced sailor you can choose to leave the flotilla for a few days, joining up for the barbecue evening or other social event. Those new to sailing or looking to brush up on their skills can take advantage of our learn to sail on flotilla option. Ask the sales team for more details. You join your flotilla in our beautifully located Palairos base, just a short drive from Preveza airport. The superb setting, with views across to Meganisi and Scorpio, the island owned by the Onassis family, will soon put you in the holiday mood! After settling in on your yacht there’s time for a stroll around the shops and a relaxing dinner. Enjoy a sail across to Sivota on the East coast of Lefkas. This is an unspoiled fishing village which has managed to keep its Greek character through all the years despite the growth of tourism. Here you’re spoiled for choice as there is a variety of shops, cafes and tavernas. Across the channel to the picturesque fishing port Polis on Ithaca. The bay has a beautiful pebbly beach with clear, turquoise waters, and you can take a walk up to the archaeological site of Loizos Cave on the north side, which used to be a worship place during ancient times. Prior to the 1953 earthquake, Eufimia was the main ferry port on Kefalonia. Now it remains one of the most picturesque seaside villages on the island with all the necessary facilities. Enjoy fantastic views from above the town, a good selection of tavernas and a trip to the nearby Melissani Lake Cave is definitely worthwhile. Sailing north back to Lefkas we head to the windsurfing hub of Vasiliki. A bustling village with great tavernas right on the water's edge. Vathi is a tiny port on the northeast coast of Meganisi. In a sheltered position at the end of an inlet, it has a few waterfront tavernas. Settle down to a cold beer and plate of mezes by the quayside and watch the ferry and fishing boats come and go. Rather than head straight back to base you can return to one of the many anchorages on Meganisi, perhaps Abelike Bay, for a last lunch stop and swim before returning to Palairos. Disembark at Palairos and take your included transfer back to the airport. Routes may vary due to weather conditions & other factors. *The flotilla will be doing an alternative route on 28 April depending on which tavernas and shops are open this early in the season. Those who wish may stop over at one of the beautiful bays on Meganisi for a midday swim. Spartochori is a great setting for an evening watching the amazing sunset over the top of the village. We cross the channel over to Fiskardo on Kefalonia. This beautiful old fishing harbour is considered the pearl of the Ionian Islands. You’ll find a wide choice of stylish and sophisticated shops, cafes and a variety of tavernas and restaurants. A charming seaside village on the East coast of Kefalonia set amongst rolling hills and fragrant pine trees. Be sure to visit the ancient acropolis and the nearby Melissani Lake Cave. Kioni village is an exceptional beauty set amidst a setting of olive groves. The lovely houses form an amphitheatre around the steep slopes of the bay with its amazing deep blue waters. After an enjoyable sail, relax whilst moored to the jetty, only a few steps away from the tavern. Enjoy a sail north to the island of Kalamos. Port Kalamos is a sleepy little harbour with a few restaurants and shops on the quayside for visiting yachts. Take a walk up to the old town for views and a visit to the bakery. Fuel and any mooring fees are not included. 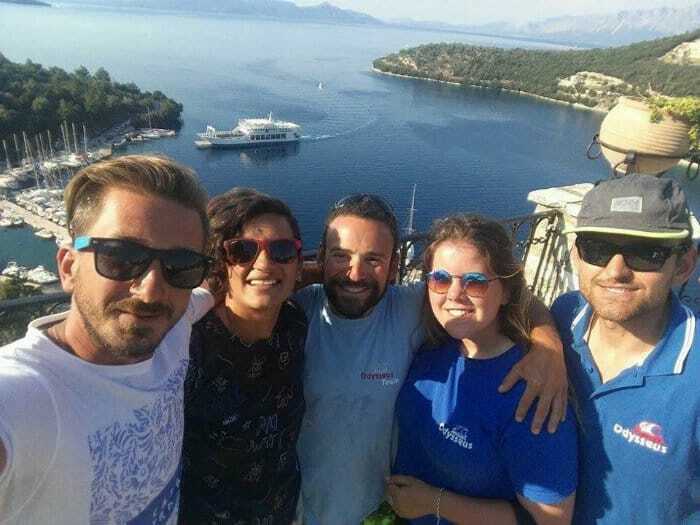 Mihai & Monica (left) take charge of the Southern flotilla (Kalamos & Fiskardo routes). A couple from Romania, they speak fluent English and 2019 will be their fourth season heading the Ionian flotilla. A very friendly and humorous couple! George (centre) is part of the shorebased team but spends most of his time alternarting between the two flotillas giving the lead crew a helping hand! The nearest airport to the base in Palairos is Preveza. Thomson and Thomas Cook have flights from Gatwick, Manchester and Birmingham. Easyjet fly from Gatwick to Preveza. We can also offer seats on a chartered British Airways flight from London Heathrow to Preveza. One return transfer per yacht will be arranged for you once we have your flight details. This is included regardless of whether you book flights directly with the airline or through Nautilus Yachting. We will meet you at the airport and take you directly to the base. The transfer takes 30 minutes. Airport transfers to/from Preveza airport (one transfer per yacht), end cleaning, bedding & towels, services of flotilla staff.